Now we know that general interest rates are low, but even on a percentage-of-Treasury basis, munis are at best fair value. From 2001-2007, the average 10-year muni/Treasury ratio was 86.9%. Currently its 90.2%. Hardly screaming value. What about muni credit quality? My concern is two fold. First, municipalities are not very nimble. One of the big positives among corporate securities (stocks and bonds) has been their ability to rapidly cut costs in the face of falling demand. IBM can lay off thousands at a moment’s notice. Anadarko can shut down oil rigs. Boeing can shutter plants. But municipalities the proverbial Bantha trying to turn around in quicksand. A governor can’t just unilaterally say the State needs to shut down certain programs. A mayor can’t unilaterally shorten work hours. A county council president can’t lay off unionized public employees. They literally don’t have the power to do so, at least in the overwhelming majority of cases. They just can’t react quickly to a changing revenue environment. Expense management is therefore a major challenge. How bloated is state and local government spending? I’d generally say that local government spends what it has. So when revenues rise, no one in the state legislature says “Hey, let’s save this for the next recession,” unless mandated by law to do so. They spend it! What looks better to constituents? A nice new park or a larger “rainy day fund?” Politicians will pretty much always pick the nice new park. Revenue is also going to be a continued challenge. There are four major areas of revenue collection for state and local governments. Residential property taxes, corporate property taxes, income taxes and sales taxes. So even if all four bottom out here (if you care, I think home prices will but the other two won’t), all are starting from a weaker start. For example, if state sales tax started the 2008-2009 period at 100, its now 91 (i.e., a 9% decline). If the decline was evenly distributed during the year, the average collection would have been at a 95.5 level during the year. But for 2009-2010 we’re starting at 91. Sales tax collection could bottom here and still collections for 2009-2010 would be down 4.7%. The same principal applies to property and income taxes. Commercial real estate is likely to get worse before it gets better. That’s a subject for another SMACKDOWN but suffice to say that commercial property taxes aren’t going to be a source of revenue increases for municipalities for some time. So we’re likely to see continued budget problems in 2009-2010 and I’d think 2010-2011. Will there be large numbers of municipal defaults? Probably not. Large municipalities will figure out a way to pay off bond holders. In general, municipalities don’t have the option of choosing to pay other expenses but not pay bond holders. A state legislature can’t say they’d simply rather pay public employees than debt service. It isn’t an option. In addition, many local municipalities have their tax rates determined by their budget, not the other way around. In other words, property tax rates are not voted on by the local government, but in fact a plug for whatever rate makes the budget balance, debt service included. So I think what you are going to see in 99% of situations is cuts in governmental services (sometimes severe) but not cuts in what’s owed to bond holders. There will be exceptions, probably far more exceptions than in years past. The history of municipal bond defaults is extremely light, and we could well wind up with more defaults over the next 24 months than we had over the previous 24 years. It won’t be a disaster, but it will be pretty bad. I recently made a case that I thought the dollar would keep declining. What I didn’t say is that I thought there would be a dollar crisis, precipitated by our ballooning debt. First let’s look at current foreign participation. The following chart shows TIC data for Treasuries (net purchases) month-by-month (in blue) and 12-month rolling averages (red). Can’t see any crisis here. The rolling average is basically in the same range its been since 2004. Could a crisis develop? Sure, but I don’t understand how the U.S. gets into a currency crisis and there is some other currency that is a) large enough to take the huge net flow the U.S. currently absorbs and b) not impacted by the U.S. crisis. 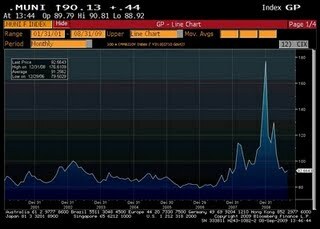 In other words, let’s look back at CDS trading among sovereigns. 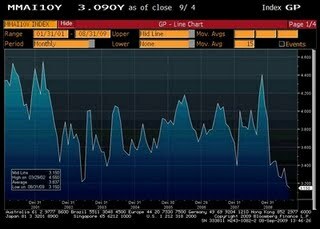 Here are the levels on 12/31/2007, according to Bloomberg (all in bps, higher means more risk). What does this tell us? 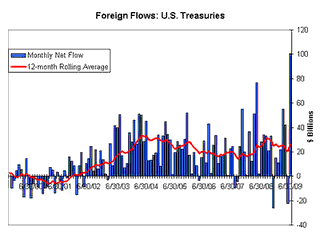 Confidence in the U.S. declined substantially during 2008, but it also declined in all our largest “competitors” for foreign flows. If things really are that bad here in the U.S., things are probably pretty bad elsewhere as well. We’re also probably past the peak for Treasury borrowing. Not in terms of absolute debt but in terms of the need to sell new securities. Hopefully there will be no “second stimulus,” and the TARP funding won’t need to be increased. But assuming both those things, I think the marginal supply of Treasury bonds should be declining, thus reducing the fear of a simple supply overwhelming demand. Over time, I’m sure emerging nations would love to create a new reserve currency. But as things stand, there is no way a new currency wouldn’t have a U.S. dollar component. There was talk of Brazil, China and Russia using more SDR’s from the IMF in place of dollar assets. But such a move strikes me as entirely political, meant to look like a move toward independence in the eyes of each country’s populace. In reality SDR’s derive their value from… Ewok tom-tom roll… the U.S. dollar, pound sterling, euro and yen! I think the reality is that the U.S. is going to have to raise taxes to pay down our debt. I think there will be significant political pressure here to do something about the deficit, as I think Americans don’t like the idea of ballooning debt. Healthcare reform may or may not happen, but either way, its going to just mean more or less of a tax hike. That’s going to create significant problems in terms of consumer spending, but would improve the whole foreign Treasury participation problem.